What would seem to be a simple object, a staircase, is transformed into an inspiration for reflecting about the surrounding southern Chilean extractive landscape, who has access to it and who receives its impacts. These realities are connected through Chilean history and the everyday stories of its inhabitants. Several months have gone by, but I still remember the day when the rain finally stopped and I could leave the Mapuche community I was visiting, in the Gulf of Arauco, southern Chile. I jumped onto a pickup with four other youngsters living in the area, all of us somehow related and supporting in various ways the Mapuche struggle for sovereignty of their ancestral lands and uses. On our way south, we stopped to collect cochayuyo seaweed (Durvillaea antarctica) from the Lebu seashore. According to the CASEN 2009 survey, Lebu was the second poorest commune in Chile, where 39% of inhabitants live in poverty. Collection of cochayuyo algae in Caverna de Benavides, Lebu. 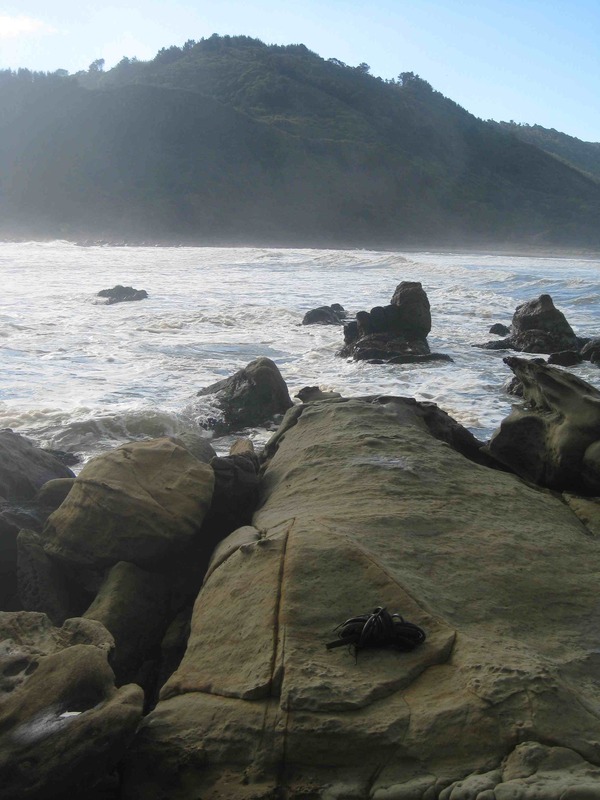 Collecting algae and other sea and forestry products is part of the local subsistence economy, as well as of the conviviality and cultural activities of fishing, peasant and Lafkenche-Mapuche communities in southern Chile. Source: author. As it was getting dark, I decided to spend the night at Cerro Alto, in the commune of Los Álamos, with the aim of continuing my way towards Cañete on the morning of the following day, where I planned to do some more interviews. However, that night, turned out to be crucial for experiencing two fundamental aspects “a traveller” undergoes when touring southern Chile. First, the hospitality. I was kindly hosted by the family of one of the boys who was with me in the community, his ex coal-miner father and his multi-tasking mother (weaver, hairdresser, mother and housewife), like most women in the territory. I slept in a small room facing the road that comes through Cerro Alto. During the night, the windows vibrated constantly, due to the passage of truckloads bursting with logs harvested from the plantations in the region, on their way to the cellulose plant in Horcones, a plant that is the property of Arauco enterprise. The other key point when touring southern Chile is the constant perception of inequality. I came closer to this thanks to an invitation to participate in the creation of the olla común (common pot) by the Comité de Cesantes de Cerro Alto (Cerro Alto’s Committee of the Unemployed). That story inspires this post. Truckloads loaded with wood to be processed as cellulose or timber for export. In my nearly two years of field-trips in southern Chile, I think this is the picture I captured the most along different roads in the Maule, Bío-Bío, Araucanía and Los Ríos regions. Source: author. 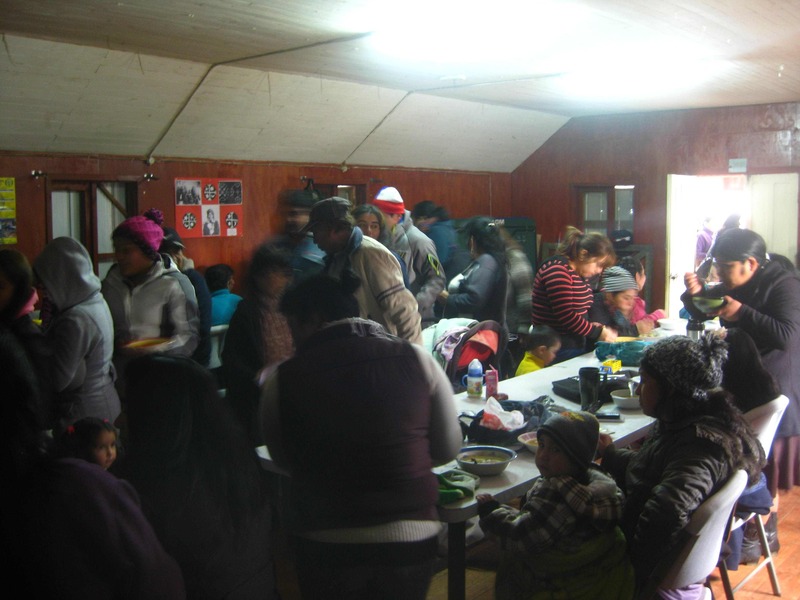 Cerro Alto, located in the Los Álamos Commune, shares many of the characteristics of the broader province of Arauco where it is located: forest plantations, unemployment, drugs and evangelism. And poverty. In the last 60 years, the area has transitioned from an economy based on subsistence coal mining and agriculture to one based on forestry extraction. Labour opportunities in the area are either forestry (whose conditions have improved in recent years but employs mostly men, with a decreasing need for labour due to mechanisation) or “emergency” projects: temporary jobs that “subsidise” the community and that, according to a local leader “lower the self-esteem of people, who are paid to do nothing.” In recent decades, rural areas have been emptied, people have migrated either to urban areas, including Santiago, or northern areas where copper mining gives more money. 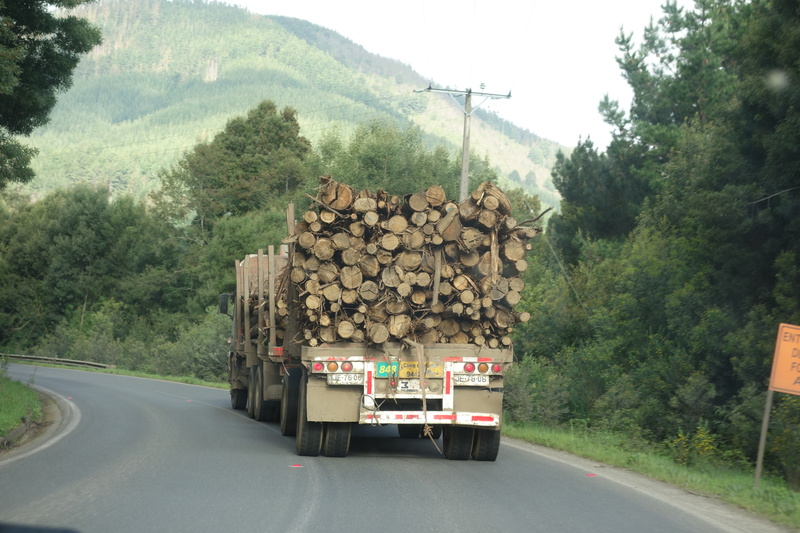 In Cerro Alto, as in the other areas surrounded by almost 3 million hectares of pine and eucalyptus plantations, the experience of local inequality is reinforced by the fact of seeing, every day, every hour, truckloads stacked to the brim with logs. The forestry enterprise Arauco earned US$ 5.1 billion in 2013, whereas the women I spoke with earned 200.000 Chilean pesos (around US$ 200) per month – if they were “lucky” to receive one of the “emergency projects”. “Every day thousands of trucks passing through, with our wealth and we, we are hungry and homeless,” says one of the women present. “Till the point that we can’t even buy ourselves a staircase” said another attendee. The stairs inspiring this story. Source: author. These are the new stairs of the building where the Committee held their meetings for the past four years. Intense rain had destroyed the former cement-made ones, and for several days the Committee’s members could only enter through a precarious balancing act on a stick. The staircase is itself the expression of the experience of inequality embedded in the extractive landscape: “we are surrounded by wood but we needed a councilor to support us through a lot of bureaucracy to access these 20 sticks that form the staircase”, one of the participants explains to me. The Committee, mostly formed by women, has met for four years with the intention to mobilise and train people in order to try and reverse the local lack of employment. In June 2014, over a hundred women organised for the double task of claiming municipal job positions and collectively feeding themselves and their children. They aimed to receive some bags of food, nappies and medical care for those who were sick. But it wasn’t just about asking and waiting. Many of them, for the first time, were inspired to block the motorway, making visible their despair and hoping to call the attention of the recently instituted supposedly socialist government in Chile, with the arrival of President Michele Bachelet in March 2014. Some women planned to build a sewing or recycling cooperative in an abandoned factory building. The “common pot” (olla común) at a Committee of the Unemployed meeting. Source: author. Talking with several people on the Committee, it is easy to realise that this was not “just” a punctual struggle for decent employment or a request for “alms” from the forest industry. The issue of class, economic and social inequality and fear were expressed in first person and present time, here and now, but also from their own past and the voices and memories of parents and grandparents during the dictatorship of Pinochet. In his text “Chile Actual: anatomía de un mito” (Current Chile: the anatomy of a myth) Tomás Moulian explains how Chile today inherits and reproduces the economy, politics and development of the “capitalist revolution” that was established under the Pinochet dictatorship. One of the political projects of the dictatorship was forest development in southern Chile. The relationship between the forestry extractive model and the dictatorship, its impacts in time, in the individual and collective economic and socio-environmental impacts and above all, in life, came to be all expressed in the history of these stairs. The stories of persecuted and “disappeared” parents, the memories of militant mothers, the anecdotes of the land occupations, the tears shed for children that had to migrate for employment or those who decide to escape through drugs, the memories of fathers who are always absent due to eternal working days in the forestry industry. All of these are gathered in the steps of that staircase. In each of its fibres that, instead of being exported to Japan or China, served to tell this story and the daily stories of all the people in the Committee, who met together in the search of recovering, little by little, the sovereignty and autonomy of their own lives.